Typewriter. Ring-binder. Scrapbook. 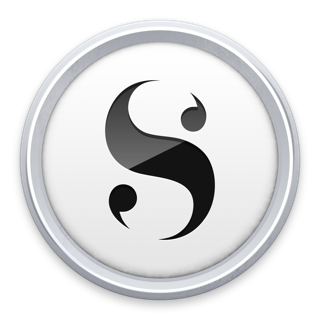 Scrivener combines all the writing tools you need to craft your first draft, from nascent notion to final full stop. Tailor-made for creating long manuscripts, Scrivener banishes page fright by allowing you to compose your text in any order, in sections as large or small as you like. Got a great idea but don’t know where it fits? Write when inspiration strikes and find its place later. Grow your manuscript organically, idea by idea. Whether you plan or plunge, Scrivener works your way: meticulously outline every last detail first, or hammer out a complete draft and restructure later. Or do a bit of both. 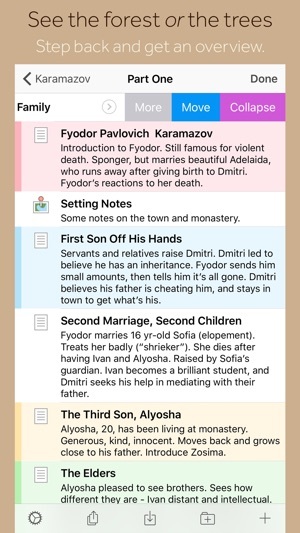 All text sections in Scrivener are fully integrated with its outlining tools, so working with an overview of your manuscript is only ever a tap away, and turning Chapter Four into Chapter One is as simple as drag and drop. Need to refer to research? 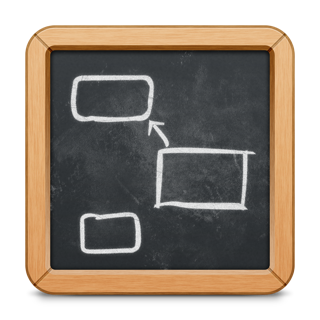 In Scrivener, your background material is always at hand. Write a description based on a photograph. Reference a video or PDF. Check for consistency with an earlier chapter. On the iPad, open two documents side-by-side; on the iPhone, flip between research and writing with just two taps. Once you’re ready to share your work with the world, simply compile everything into a single document for printing, or export to popular formats such as Word, PDF, Final Draft or plain text. You can even share using different formatting, so that you can write in your favorite font and still keep your editor happy. * Requires a Dropbox account (not compatible with iCloud). You can contact us at ios.support@literatureandlatte.com, visit our forums at http://www.literatureandlatte.com/forum, or find us @scrivenerapp on Twitter. • Fixed serious bug in Dropbox sync that was causing crashes for many users. • Web page import now checks to avoid hangs caused by invalid URLs. • On iOS 11, long-pressing a document link now opens it. 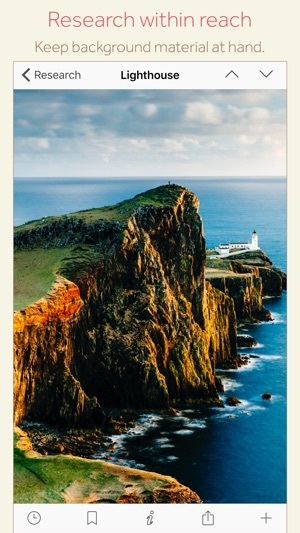 • Added support for .heic and .heif image files, the format now used by the iOS camera on 11.2 and above. • Fixed bug whereby compiling to plain text with both “Titles Use Markdown Levels” and “Convert to Basic Markdown” checked would cause hashes in Markdown headings to be escaped. Serious creation calls for serious tools. After all, nobody’s building skyscrapers out of sticks. If you’re writing a long manuscript, your tool is Scrivener. 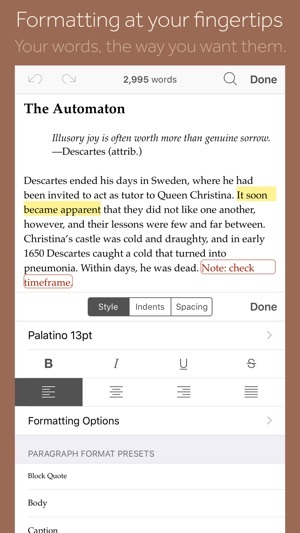 Desktop users already know how seamlessly Scrivener binds your inspiration, outlines and writing—but you’re not always at your Mac—and thankfully the iOS app packs the same rich complexity. And yes, of course it syncs flawlessly so you’re never tied to just one device. 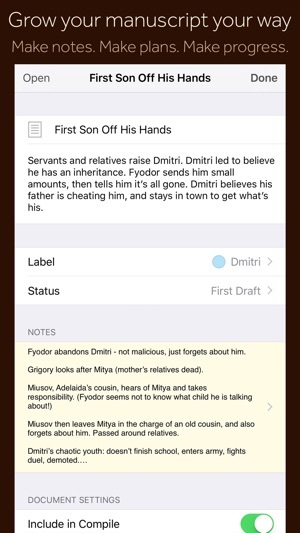 I was exuberant to see Scrivener materialize with an ipad version. I have head a lot about it. I am a relatively new scrivener, just learning it, and involved in a lengthy writing project. I write mostly on iPads because I am rarely home and they are easier than laptops to lug around. I have the new ipad, 10.5, 256gb, and was looking forward to using scrivener on it. Unfortunately, the Dropbox syncing is maddening. Today, for instance, it refused to sync and kept shutting down. After the first time, I got it back and backed up everything I was working on, and I was lucky I had the foresight to do that for Scrivener kept crashing. When I returned to the desktop, it wanted to sync with the ipad. This it did, but with the older version of the chapter that I was editing and I thanked the gods for that back-up I had stored elsewhere. I ended up deleting the chapter and starting over with the back-up I had emailed to myself. I do not know what to say here. Not sure if the recent update will solve the infuriating Dropbox problems. I will give it another try and see what comes of that. If it continues, I will just have to use scrivener on the desktop, writing on another program with the ipad and copying it over to scrivener later on. Ultimately, I think Scrivener has to be taken out of Dropbox and put onto the cloud. 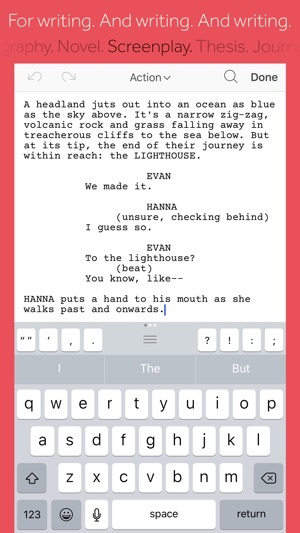 Scrivener is very easy to work with on my iPad. I took it on a trip and worked on a number of new projects created on my iPad. However, on return, I tried to set up the Dropbox sync and it didn't work. Thanks to Jeff at Literature and Latte for working through this with me over several detailed replies. The options are to backup my iPad to iTunes on my iMac and work with files from there or, easier, to sync with Dropbox and work from there. Projects cannot exist in both places. However, when I first (and many subsequent attempts, reinstalls, etc) tried to sync my existing iPad Projects to Dropbox, a folder was created, but it was empty. The Projects and the empty folder showed in my iTunes file browser. So, I understood what was happening, but couldn't fix it. Today I decided to add a new "Test" Project on my iPad with one file in it. Then I synced with Dropbox. For the first time, a Dropbox list appeared in my iPad's Projects list and the Apps/Scivener folder in Dropbox showed my "Test" Project. From there, Jeff told me to tap edit on my iPad and drag the projects from "On My iPad" to "Dropbox". Did that, synced, all is well. Also synced with iTunes and now the file browser shows the folder and it's no longer zero kb. Hope this helps someone with the same issue. Edited response: Many thanks for updating your review now that you have everything sorted! I'm glad Jeff was able to help you find the problem. Please let us know if you run into any other issues. I hope Scrivener works well for you from now on!